During the past year or so, I have been constantly asked two questions with unerring predictability. One: Should the Racial Discrimination Act be amended? Two: How is everyone getting along at the Australian Human Rights Commission? Being among friends of human rights, you have heard all that needs to be said about the RDA. Few provisions of federal legislation have been as widely debated as section 18C. As for that second question, it’s fair to say my fellow Commissioners and I are flattered by the interest. If there is anything worse than being talked about, it’s not being talked about at all. Personally, I’ve been touched to find so much interest in the collegiality of the Commission. It is true that we have some differences. Some of us favour the blue ties that are currently in fashion; some of us favour red ties. As recent appearances on Classic FM’s Midday Interview reveal, we do not necessarily share musical tastes. But, lest people get too excited about where we diverge, you should know this: we all share a love of liberty. Freedom is at the heart of my work on matters of racial discrimination. But it is not freedom as an abstract ideal or an undergraduate one-word slogan. Freedom does not exist in a vacuum. There is a reason why it’s liberty, equality, fraternity. It’s not liberty, liberty, liberty. Freedom for me means this. I believe that people should be free to express their identity; should be free to live with dignity; should be free to participate in our national life as an equal. Everyone has a right to be free from the effects of bigotry and from the social tyranny of discrimination. This year saw a victory for those of us who believe in such freedom. We defeated the proposition that Australians had a right to be bigots. There remains no good reason to be repealing laws that represent our commitment to civility and tolerance. Nor is there any cause to be changing laws that have operated as they were intended to for almost twenty years. Let’s remember the history behind Part IIA of the RDA. The rationale for Part IIA, though, was clear. Racial vilification provisions were required because racial abuse and harassment could escalate to racial violence. It was important that the law step in. And it is essential that the law continues to play this role. The law stands, in part, to reflect our values as a society; it sets a standard for acceptable behavior. One of the dangers of repealing or weakening racial vilification laws is that it can embolden people to deal out racial abuse – to believe that their freedom of speech, even if exercised with the intent of wounding, must trump the freedom of another. The prominence of ‘classical liberal’ ideas about free speech has been a curious feature of the contest over the RDA. It is said, for example, that the law should play no role in regulating speech, that laws prohibiting racial vilification involve a form of censorship. If there is racist speech, we should put our faith in good forms of speech to combat it. Let us expose racist bigotry to the disinfectant of sunlight; let ridicule and social criticism do the job. It is true that good speech can overcome bad speech. But what about those situations when it doesn’t? What if someone from a marginal or vulnerable social position cannot speak back? These are not questions that come naturally to those who may be accustomed to enjoying social power and privilege. There is another thing, too. The idea of flushing out racism may sound good in theory. I’m not sure it is so simple in practice. I’ve yet to hear anyone who has been subjected to racial abuse – anyone who has been slandered, humiliated or demeaned – say that they are grateful for having the experience. Few targets of racial abuse would celebrate their experience for having brought bigotry and racism out into the open. Most would prefer for it never to have happened. With so called classical liberal arguments, I believe we are seeing at work the ethos of homeopathic machismo – the notion that a tincture of poison will lift us to heights of tolerance. (3) This notion may have some validity for the spectator who has had the benefit of being insulated from social violence. For this spectator, seeing the real face of racism for the first time may leave them with a new understanding of the harm prejudice can inflict. However, not all spectators would benefit; we shouldn’t revel in exposing people to bouts of bigotry. More to the point, we must not make the mistake of forgetting about the people who are the targets and victims of racial vilification. If we are talking about lifting people to new heights of tolerance, we shouldn’t forget that the burden of lifting doesn’t fall on everyone equally. It is true that not all of us are lifters. The ‘classical liberal’ approach to free speech and race reflects such thinking. It explains why ‘classical liberals’ believe only physical violence warrants the attention of the law. It explains why we hear from them a lot about the freedom to unleash bigotry but not much at all about the freedom of those subjected to such delightful horror. In our current debates, we have also seen this sensibility towards the sublime in discussions about patriotism. There have been more muscular demands that people make declarations of their national loyalty. Last week, for example, some commentators were enraged by a decision by Woolworths to take off their shelves T-shirts that boasted, ‘Australia: love it or leave’. During the past few months, there has been considerable debate about the term ‘Team Australia’ involves a subtle form of racism. Let’s clarify a few things. There is, as it were, very little to be gained from using the word racism without discrimination. Patriotism is not the same as racism. To love your country need not mean that you subscribe to notions of racial superiority, or that you believe some racial or ethnic groups cannot belong to your society. In the case of the ‘Love it or leave’ t-shirts, many of us may not like the idea of an aggressive or swaggering patriotism – but we shouldn’t make the mistake of believing that’s the only kind of patriotism possible. Some of us may also question the use of ‘Team Australia’ – but it makes little sense to dismiss it as racist. The phrase merely begs the question: is ‘Team Australia’ just shorthand for an Australian liberal democratic community, or is it supposed to mean something else? To be sure, friends of human rights haven’t always been comfortable with patriotism. Our work, our attention, is directed at the universal. Even international standards, however, require domestic expression. The universal requires the particular. As citizens we must not surrender the language of patriotism, particularly at a time when some may be calling for the limitation of freedoms by directly appealing to patriotic sentiment. Now, more than ever, we need to reflect on how a love of country can direct our energies towards liberty rather than tyranny. Given rising anxiety about terrorism – underlined today by the troubling events in Canada – we have many reasons to be vigilant. But those in positions of leadership have a special duty to ensure calm and proportionate responses, to avoid inflaming community sentiment. On this measure, there is much room for improvement. Consider the interim ruling by parliament’s presiding officers to ban facial coverings in the building’s public galleries. This ruling, had it stood, would have created a form of religious segregation in our federal parliament. It would have treated those who wear items of religious clothing such as the niqab like second-class citizens. Like many others, I welcome the decision earlier this week to reverse the interim ruling. But the original burqa ruling should never have been made. In the first place, the burqa is something that is only rarely seen in Australia. Here, the most common form of covering worn by Muslim women is the hijab or headscarf. The niqab, a full veil, which leaves only the eyes of the wearer visible, is not commonly worn. Whether some have managed to confuse the burqa with the niqab, or even the hijab, remains unclear. If there were security issues about face coverings at parliament, this seems most easily resolved by common sense screening as opposed to segregation. It is worth noting that NSW has had for several years laws that require people to identify themselves when required – laws that Muslim Australians have accepted without rancour. To date, I’m not aware of any expert or authoritative advice that the burqa or niqab represents a security threat distinctive from any other item of clothing. One message must get through: it is wrong to judge entire communities based on the actions of extremist minorities. In the case of Islamic extremism, ISIL and its supporters are not representative of Islam. The overwhelming majority of Muslim Australians do not subscribe to the abhorrent ideologies associated with ISIL. As with all members of the community, Muslim Australians are entitled to fair treatment. That there may be a racial element to anti-Muslim sentiment is, in my view, indisputable. It is troubling, though, to find that those rehearsing anti-Muslim bigotry are hiding behind semantics. Some will say that suggestions about anti-Muslim feeling being racist involves a confusion, because Islam is not a race. These people will say that anti-Muslim behaviour has nothing to do with matters of racial discrimination because Muslims do not constitute a racial or ethnic group. Yet it is clear that hostility against Muslims can involve a racial dimension, and often does. On the one hand, attacks on the basis of religion can be used as a surrogate for racial abuse and harassment; on the other, particular racial and ethnic identities are being commonly associated with the Islamic religion. Race and religion, in these respects, cannot be neatly divorced from one another. But whether it’s based on race or religion, the basic principle must remain the same: bigotry and nastiness warrant our condemnation. On matters of race, the negatives, the challenges, can appear overwhelming. Progress must always be fought for; often it can be undone by a moment’s opportunism or recklessness. Yet there are sources of encouragement. People are standing up to racism, something we encourage through the ‘Racism. It Stops with Me’ initiative that the Commission leads, and of which the Castan Centre is a supporter. 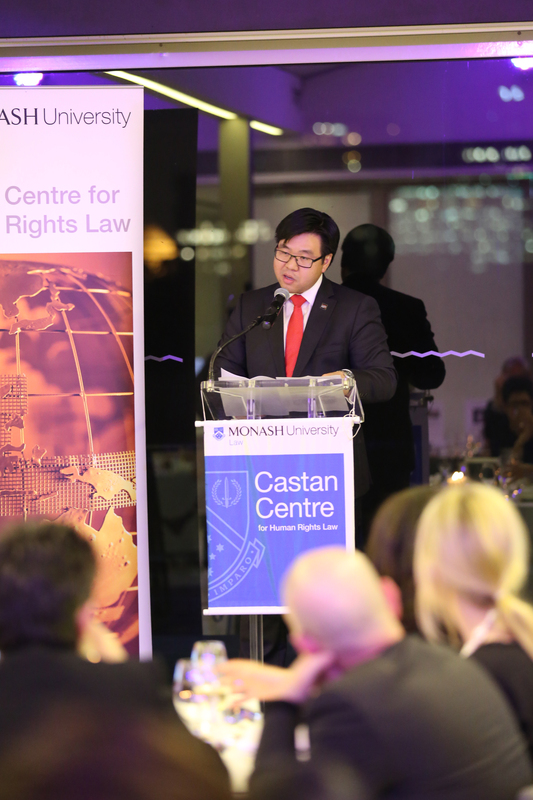 I do want to take this opportunity tonight to thank everyone at the Castan Centre for their support of the Commission’s work. It’s instructive that Castan was one of the earliest supporters of ‘Racism. It Stops with Me’: it speaks of how you are a model for engaged scholarship, for how research and teaching on human rights can shape its practice. I can tell you this: it is very hard for me not to notice the Centre’s impact. Its work is ubiquitous. I can’t walk a few metres down the corridors of the Australian Human Rights Commission without spotting on desks the unmistakable heft of Sarah Joseph and Melissa Castan’s book on the ICCPR. It seems that one in about three or four policy officers have some connection to the Castan Centre: whether as a former researcher or student. And on any matter of public policy – whether that’s national security, immigration or free speech – again, this Centre’s staff are making valuable submissions. It’s testament to your leadership that so many of the human rights community is here tonight, and I hope everyone will be generous in their support for Sarah and her colleagues. Let me conclude on a note of reflection. This week has been one for all of us who are friends of social justice and human rights to mourn the passing of Gough Whitlam and to celebrate his achievements. We have lost a titan. He was our progressive maximus – a prime minister whose Government completed the work of ending the White Australia policy, opened Australia to Asia, embraced multiculturalism and introduced the Racial Discrimination Act, this country’s first federal human rights legislation. Just about everyone this week has had a story to share about Gough Whitlam; I am afraid I only met him once when I was an awestruck teenager. But as someone who grew up in western Sydney, I was surrounded by Whitlam, by things called Whitlam. I grew up reading at the EG Whitlam Library in Cabramatta; my cricket team’s ground was named Whitlam Park; my local swimming pool was the Whitlam Leisure Centre. There was a reason we named everything after him in that part of Sydney. He was, in every sense, an enlarger of our life, a man who made Australia a bigger place. I can imagine hearing his imperious voice urging encouragement on all of us tonight. Because, friends, there is much for us to do in defending human rights; there is much to do in making sure we see the best of our country. There is every reason for us to maintain our rage and our enthusiasm. 1. Reported in ‘Race hate: voters tell Brandis to back off’, Sydney Morning Herald, 13 April 2014. At http://www.smh.com.au/federal-politics/political-news/race-hate-voters-t… (viewed 20 October 2014). 2. Human Rights and Equal Opportunity Commission, Racist Violence: Report of the National Inquiry into Racist Violence in Australia (1991) pp 277, 301. At https://www.humanrights.gov.au/sites/default/files/document/publication/… (viewed 24 October 2014); see also Royal Commission into Aboriginal Deaths in Custody, Final Report, vol 1-5 (1991). At http://www.austlii.edu.au/au/other/IndigLRes/rciadic/ (viewed 24 October 2014); Australian Law Reform Commission, Multiculturalism and the Law, Report No 57 (1992). At http://www.alrc.gov.au/report-57 (viewed 24 October 2014). 3. J D Peters, Courting the Abyss: Free Speech and the Liberal Tradition (2005), p 146. 4. E Burke, On Taste; On the Sublime and Beautiful; Reflections on the French Revolution; A Letter to a Noble Lord (1980). 5. T Soutphommasane, The Virtuous Citizen: Patriotism in a Multicultural Society (2012); T Soutphommasane, Reclaiming Patriotism: Nation-Building for Australian Progressives (2009). 6. H Aston, ‘Dozens of anti-Muslim attacks as Islamic leaders warn of community fear’, Sydney Morning Herald, 9 October 2014. At http://m.smh.com.au/national/dozens-of-antimuslim-attacks-as-islamic-lea… (viewed 22 October 2014). 7. J Calixto, ‘Turbans target of racial abuse’, SBS News, 28 September 2014. Athttp://www.sbs.com.au/news/article/2014/09/28/turbans-target-racial-abuse (viewed 24 October 2014). Previous Post Previous post: Have You Got That Right?